Sunday Morning a CHP Officer was involved in a single vehicle accident. The CHP Officer Crashed into a freeway divider. The Officer sustained scrapes and bruises and broken bones. He was Airlifted to the hospital and is expecting a full recovery. Traffic was back up for miles on the 101 freeway as multiple lanes were closed 40 miles northwest of downtown Los Angeles. As cause of the accident is still unknown, always remember the importance of target fixation. The Los Angeles Motorcycle Lawyers at RiderzLaw wish the CHP Officer a Speedy recovery. Sunday Afternoon, around 2:00 p.m., an accident eastbound on Highway 126 near Piru was reported. it was involving two Motorcyclist and a Subaru. The original report has the Motorcyclist rear ending the Subaru. although, still under investigation. Multiple fire department crews and two ambulances were called to the scene, with eastbound traffic delayed for a time as the aftermath blocked the slow lane. Two patients were taken by ambulance to Henry Mayo Newhall Hospital in Santa Clarita. Their injuries were described as moderate to major. The Los Angeles Motorcycle Lawyers wish the Riderz and speedy recovery and hope they are back on twos fast. July 10, 2015 The actor who plays “Nathan” on the show General Hospital has been injured in a motorcycle accident. Ryan Paevey was camping with friends at Chilao Campground, located in the Angeles National Forest, when the incident occurred. Injuries to his wrist were such that the actor required surgery. Celebrity Dirty Laundry, an online tabloid, says Paevey acquired the motorcycle in December 2014. No further details were offered regarding the incident or how writers/producers will deal with the injury as it relates to the show. The first year of motorcycle ownership can be dangerous for any rider. In the beginning riders will consciously be cautious. As time goes on and riders become more comfortable on their bike, so too does their confidence. New riders should be careful not to allow their confidence gains to exceed their actual experience level on a new to them motorcycle. The Los Angeles motorcycle lawyers here at RiderzLaw wish a speedy recovery to Mr.
November 30, 2014 An accident in Montebello has led to the death of one and the injury of another. Officials with the Montebello Police Department say they responded to the incident just before 4:45 am at the 400 block of East Avenida de la Merced. On-scene they found a man (the driver) and woman (the passenger), both suffering from severe injuries. Preliminary reports indicate that the motorcycle was traveling east on the roadway when, for unknown reasons, the driver lost control of the bike and struck a curb. The riders were ejected from the motorcycle, causing the injuries. The man was rushed to Los Angeles County Medical Center where he later succumbed to his injuries. He has been identified as 19-year-old Hugo Fragoso of Montebello. The female rider also sustained severe injuries, but medical officials say she is expected to survive. In the dark and cold early hours of the morning, it is common for issues to befall unexpecting riders. September 7, 2013 Two riders who were on the same bike were injured last Sunday in Los Angeles when they crashed into a vehicle on the 400 block of East Colden Avenue around noon, according to the Los Angeles Fire Department. The LAFD says that at least one of them was not wearing a helmet during the incident. Both riders, in critical condition, were rushed to the hospital. The driver of the vehicle they crashed into suffered only minor injuries. When riders break the law by taking to the streets without proper safety equipment, they endanger not just themselves but often times others around them. The events of this accident were not disclosed, but suffice to say that we do not condone illegal behavior on motorcycles. Regardless the Los Angeles motorcycle accident lawyers here at RiderzLaw never want to see motorcyclists hurt in accidents, and our best wishes go out to the speedy recovery for our fellow riders. August 15, 2013 The eastbound 10 to northbound 110 freeway interchange was shut down following a collision that involved an LAPD motorcycle police officer during Tuesday morning’s rush hour. According to LAPD Officer Sally Madera, dispatch was notified of the incident at approximately 7:50 am. The officer involved was taken to a local hospital for a non-life-threatening leg injury. One lane was re-opened by 8:30 am with the others soon to follow. The accident caused traffic to be backed up for miles. We all know the dangers of riding in rush hour traffic, and that the officer will make it through the accident with only minor injuries is good news to us. The Los Angeles motorcycle accident lawyers here at RiderzLaw wish the victim a speedy recovery and for all the riders out there to stay safe on our motorways. 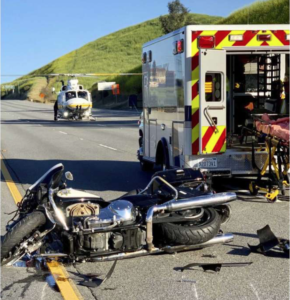 At 7 am on Sunday morning, an Agoura Hills Harley Davidson rider was flown in critical condition to a hospital after going over the side of the road in the forest north of La Canada Flintridge on Angeles Crest Highway, according to reports by authorities. The 50 year old rider was estimated to have tumbled about 100 feet down before coming to a stop, according to Los Angeles County Sheriff’s Lt. Angela Shepherd. The lieutenant said that prior to flying the victim to a nearby trauma center via helicopter, rescuers stabilized the man. We all know that sometimes a Sunday ride can take a turn for the worst, fortunately in this case the rider survived the accident and will live to ride another day. The Los Angeles motorcycle accident lawyers here at RiderzLaw wish our fallen brother a speedy recovery, and the same for all victims of riding accidents.